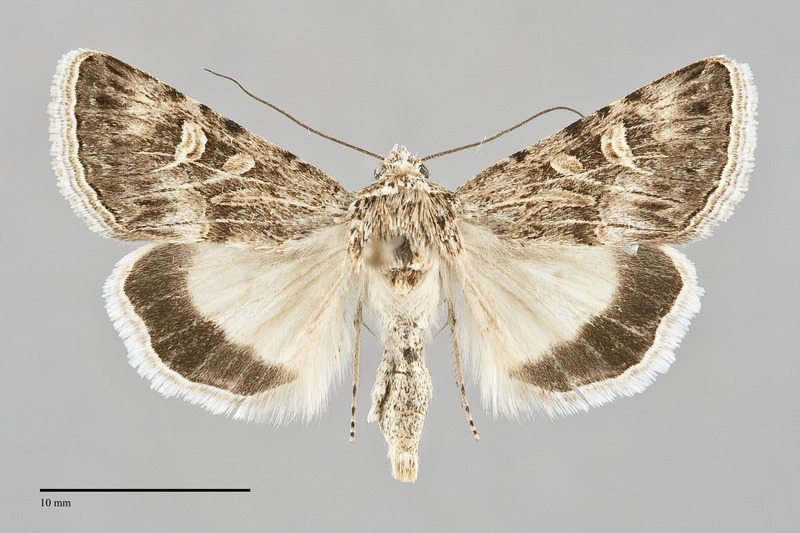 Sympistis seth is a streaky brown medium-sized moth (FW length 13 -17 mm) with a round or asymmetrically oval orbicular spot, a black-banded cream hindwing, and white fringes on both wings that flies in sandy steppe habitats in southeastern Oregon in September. The forewing is gray-brown to brown, slightly darker in the median area and on the distal wing and lighter brown to pale blue-gray in the medial subterminal area posterior to vein CuA2 and opposite the cell. The veins are pale to the mid-subterminal area and dark further distally, the pale spots in the subterminal area extending distally along each of the veins that crosses them. The basal, antemedial, and postmedial lines are gray or brown, double filled with light shade of the ground color, faint other than as spots on the costa. The basal line is located near the wing base. The antemedial line is jagged. The postmedial line is moderately scalloped, excurved around the end of the cell, touches the posterior reniform spot, and curves to join the trailing margin at a slight angle toward the wing base. The median line is gray, closely parallel to the posterior postmedial line and bent toward the base in the cell between the spots. The subterminal line is a series of pale brown spots between the veins, preceded medially by a series of black sharply defined long arrowhead-shaped marks and followed laterally by less well-defined dark gray spots. The terminal line is black. The fringe is broad, cream at the base and white distally, containing a number of very faint brown and gray lines but appearing white. The spots have black outer and cream inner outlines and are filled with slightly reddish brown containing central pale lines. The orbicular spot is asymmetrically round or ovoid, closer to the base anteriorly than posteriorly. The reniform spot is kidney- to half-moon shaped. The claviform spot is long with the tip touching the postmedial line. The hindwing ground color is cream with slight tan basal suffusion. It has a sharply-demarcated black marginal band and a white fringe that sometimes contains a thin tan median line. The head and thorax are sandy gray-brown to brown with faint transverse barring on the collar. The male antenna is filiform. Sympistis seth resembles a suite of fall-flying Sympistis species that occur in similar xeric steppe habitats in late fall. 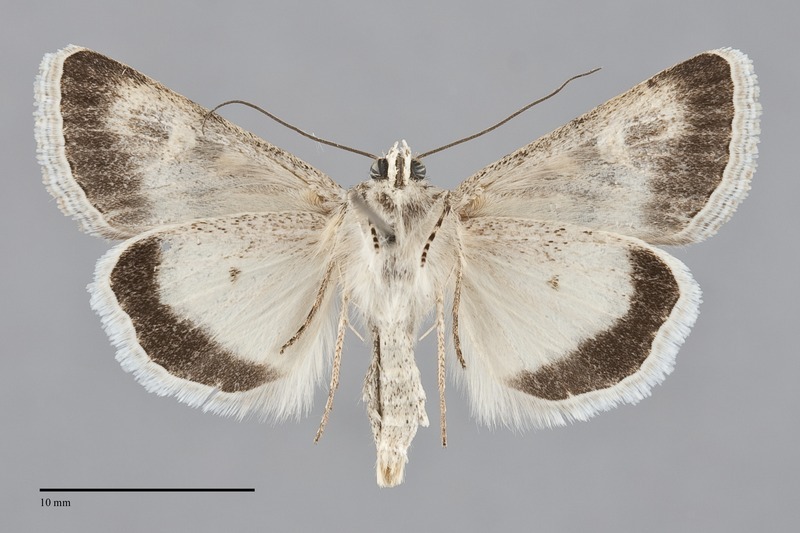 It is nearly identical to Sympistis incubus, the only one of these two species to occur in the Columbia Basin, and they are reported as flying together in Oregon in the original description (Troubridge 2008). 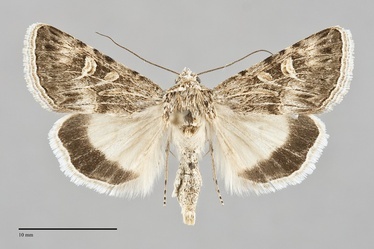 Sympistis incubus has a thin dark line in the hindwing fringe, absent or nearly so in S. seth (as illustrated), and the hindwing ground color is slightly darker with a brown tint, lighter cream in S. seth. The pale area of the posterior subterminal area is often blue-gray in S. incubus and pale brownish in S. seth. We interpret the variation in material from Oregon as evidence of intergradation rather than evidence of sympatry and suggest that these names refer to the same species in our area. Sympistis simplex can be differentiated from S. seth by its elongate oval orbicular spot. Sympistis sesmu is darker then S. seth and has a brown base to the fringe on both wings that S. seth lacks. Sympistis tartarea is restricted to east-central Oregon. It is very pale with white fringes like those of S. seth. It differs in having white or pale yellow filling of the forewing spots and extensive patches of similar color on the forewing. The type locality of Sympistis seth Troubridge is USA, Oregon, Lake County, Alkali Lake, 43° 00' N 120° 00' W, 4700'. This species is uncommon and sporadic on dry sagebrush steppe at low elevations within the Great Basin region. It can be locally common where it occurs. This species is found over sand substrate, often dunes, and is not associated with rock outcrops as are many other Sympistis species. Sympistis seth is found in the deserts of southeastern Oregon as far north as the south slope of the Blue Mountains. The range extends south into the Great Basin from our area where it is known from dunes near Winnemucca, Nevada. The range is undoubtedly more extensive in the Intermountain Region. This species flies during September, usually beginning during the mid-month and peaking at the end of the month. It is nocturnal and comes to light.